The other night I got off work earlier and stopped in at the newish BCLDB Signature store at Alberni and Bute street. I was looking to pick up some beer and did, though the selection is poor, but while standing in line I saw a cut-case display of 250ml bottles of Cabernet-Syrah Vins de Pays D'oc from JP Chenet for $4.49 so I grabbed one just for curiosty sake. 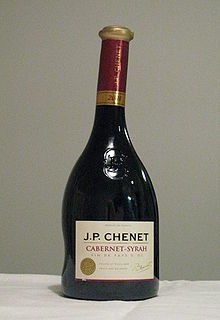 Now for some background, JP Chenet is the export label of the massive French producer Grands Chais de France a bottler and exporter of wine in France. Grands Chais de France do not make wine, they buy it in bulk and ship it to one of their huge bottling facilities in France, filter and then bottle the wine, this is industrial wine but that doesn't mean it is without merit. The JP Chenet line produces good quality, varietally true, if not exciting, wines but to me the quality/price ratio has never been enough to encourage me to buy or recommend the wines. Last night i sampled the Cabernet-Syrah and my feelings are still mixed. The wine is fine, it has no flaws and presents some decent cherry, black fruit, spicebox flavours. The tannins are very subtle, it's a new world style, but it was fine with pizza and would be a decent partner to most red meats or chicken. At a prorated 750ml price of $13.47 I wouldn't buy it again but the beauty of this product is its' size. At 250ml this is a perfect "big glass" of wine, enough to carry dinner and I know that many people can't finish a bottle of wine at dinner so this provides a low cost alternative. The bottle is also a great size for packing on a hike, or going to a picnic and the "no waste" factor means that for these occasions it represents good value. Back in the dark ages when I was a wine importer the BCLDB would not approve listing for 250ml, or 500ml, bottles because they weren't a standard package unit but it appears they have loosened their stance and that is a good idea in my mind. I like the crooked top, but 250 ml is barely enough to wet the whistle. Most people find 250ml more than adequate for a glass pour, generally in North America glass pours run in the 150-200ml range .